In a little chapel in Forli, built as a tomb for honored dead, there are three Dominicans laid in close proximity. One side is occupied by Blessed Marcolino of Forli. 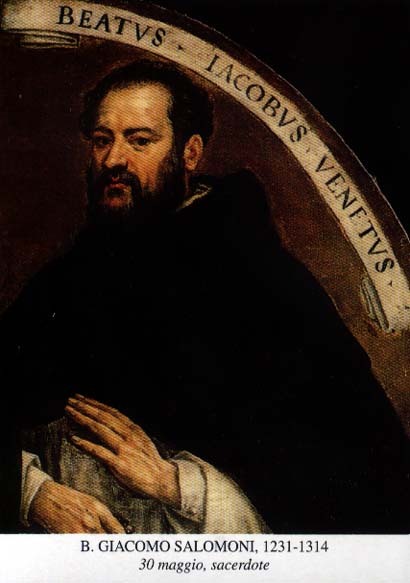 The center position is held by Carino of Balsamo, the assassin of saint Peter Martyr, whose long penance and popular holiness are now under consideration for his possible beatification; the third place is that of Blessed James of Saomomio, who was the spiritual director of Carino. James was born in Venice, in 1231, the only child of noble parents. His father died when he was very small, and his mother became a Cistercian nun, leaving him to the care of his grandmother. She did well by her orphaned grandson, and James became a good and studious boy who responded eagerly to any spiritual suggestions. Under the direction of a Cistercian monk, he learned to meditate, and on the monk’s counsel, James became a Dominican at the convent of Sts. John and Paul, in Venice, as soon as he was old enough. He gave most of his money to the poor, and arrived at the convent with just enough left to buy a few books. Seeing that one of the lay brothers there was in need of clothing, he gave his small sum to the lay brother and entered empty-handed. James wore the Dominican habit with dignity and piety, if not with any worldly distinction, for sixty-six years. He was humble and good and obedient, and there was nothing spectacular about his spirituality. He was well-known for his direction of souls, but he fled even from the distinction this work brought him. Even his retiring habits did not protect him, for the people of Venice beat a path to his door. In self -defense, he transferred to another house, that of Forli. This was a house of strict observance and very poor. Nothing could suit him better. For the remainder of his life he worked and prayed in Forli, going out to visit the sick in the hospitals and spending long hours in the confessional. His charity to the poor and the sick gave him the name ” Father of the Poor.” He is represented in art surrounded by a horde of petitioners of this sort. Representation: Dominican surrounded by a horde of petitioners; Dominican with a staff and book and the Christ-child over his heart; Dominican holding a heart with the letters “IHS” on it.